My first visit was to Brindisa. Because of problems with the electricity supply it doesn’t yet have a full menu. They told me it might be another couple of weeks, so we will hold off a full review until then. But the temporary menu offers plenty of choice of usual and some unusual Spanish delicacies. There is a focus on llesques, which is the Catalan word for large pieces of toasted bread served with helpings of cold cuts, pates, cheeses and so on. Hence the hateful cheese on toast. Made by a single producer, Rafael Baez, of Avila in Castilla y Leon, this unusual goat cheese is shaped like a log, but is said to resemble the leg of a mule. A rind composed of ash and mold means insistent flavor, more like a blue cheese than anything else. The damp, cakey, acidic paste near the rind is fierce, with unmistakable overtones of black walnut. Inside, the core remains salty, lactic, and soothing. A relatively new cheese on the scene, Monte Enebro won top goat cheese in Spain in 2003. 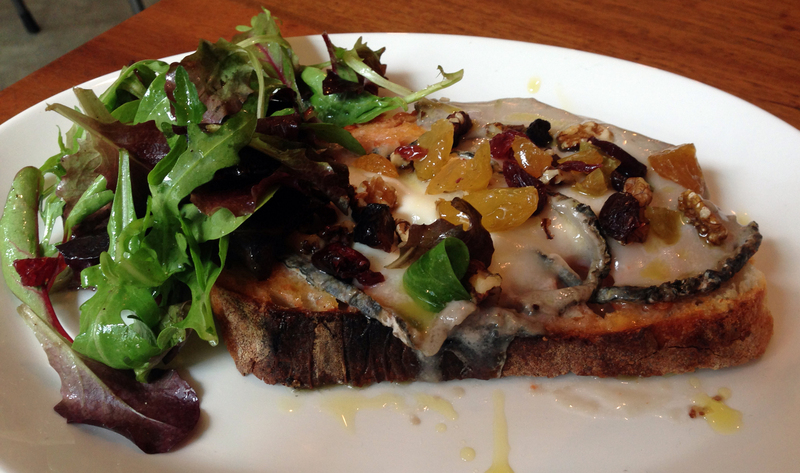 So what you get is a single slice of bread with this cheese topped with a sprinkling of nuts and dried fruit, together with a small green dressed salad. And I have to say it was fantastic, along the lines of the foregoing description. It was everything a soft cheese should be, on excellent crunchy toast. The following day I went to Papa’s Café, which is run from Papa’s Park, the community garden, playground and football pitch/basketball court in Pulross Road. There the menu is more down to earth, with the usual bacon sandwiches, etc. including, of course, the cheese and pickle toastie costing the aforementioned £1.50. Well, this was everything you expect a toastie to be, sliced white bread with Cheddar and a bit of Branston’s type sandwich pickle. I’ve no real complaint but in truth, it just wasn’t that interesting. I’ve focused on the food in this post but both places were welcoming, with helpful friendly staff and decent coffee – nothing really between them in those respects. So, what’s my verdict? 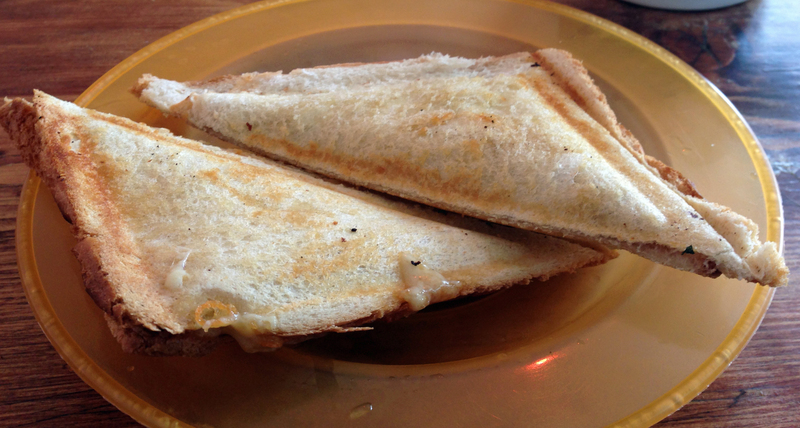 Well, almost certainly to #BrixtonMum’s disgust, I will fantasise about the Monte Enebro, which is a truly great cheese; the cheese toastie, not so much. More specifically, I know I will be going back regularly to Brindisa keen to try what else is on the menu; whereas going to Papa’s will be a once a year thing. But what about the price, I hear you ask. My answer is that I think both of them represent value for money. The thing is, my current budget for lunch is somewhere between £5 and £10. 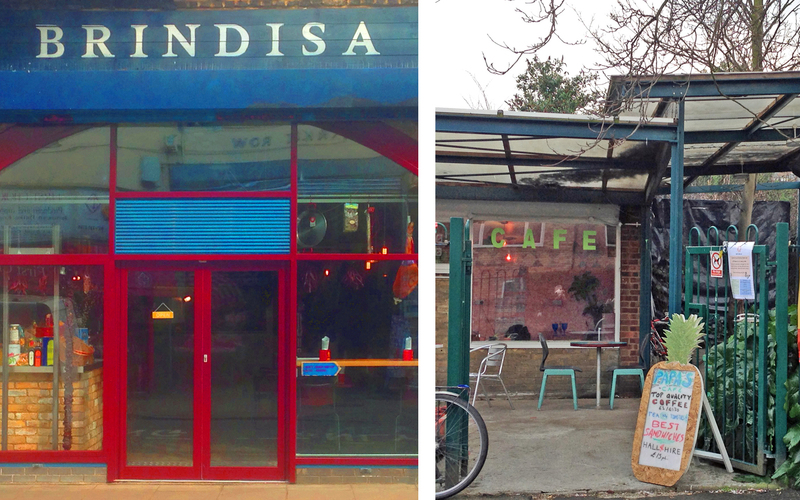 So that easily covers a light meal at Brindisa. I know I’m lucky to have the money. It’s also a fact that the Monte Enebro costs about six times as much as you pay for Cheddar from Lidl but, in my mind, it is easily more than six times better.